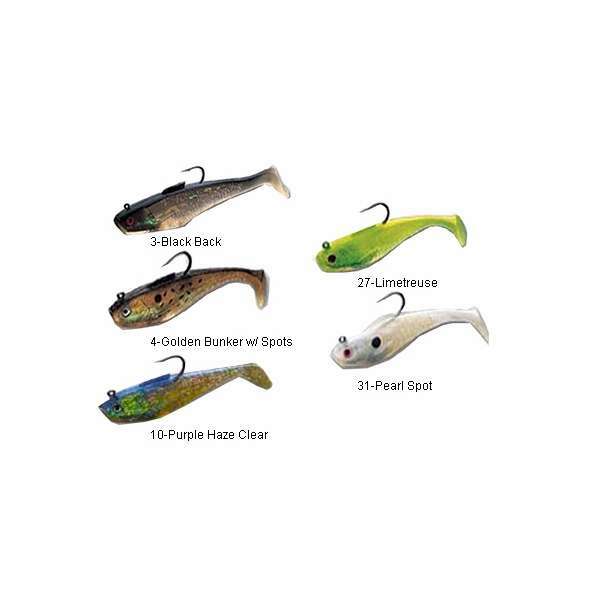 All of these lures are tank tested to assure proper performance and strike triggering action. Precise weight balancing designs in all models ensure a tumble free casting performance. The field testing is also apparent in a better-balanced swimming or jigging action. These models are available in a variety of sizes and colors. Plastic is durable enough to catch many fish. Hook is super sharp and strong enough for the job. Paddle tail swims fine but like all or most pre-rigged plastic swimbaits is that if the tail is not straight the bait won't swim straight. works good, lot of fish. Limetreuse color is super productive. Love the limetreuse when the water is murky. Great swimming bait. ProsPrice is right. Color is effective. Black/black shads kill at night. These shads are irresistible to fish and the price is right. These a good swim baits and I use these shads a lot. The rubber is not so durable and the hooks could stronger but their wise, one of my stands lures. Stripers, blues and fluke love them. If I can't catch on these, I usually have to try somewhere else. ProsStronger hook, a more durable body, and eyes that don't fall out as fast when compared to Storm's shads. ConsThe seem to have a little less action than Storm's shads. Had a night of picky fish and these were only things that worked. These are my favorite swim shads to throw. Love them off jetties. You can feel that tail working. Also throw them around bridges. Great for summer season Striper fishing. You can cast or troll with them. They are a lot like the popular Storm Lures but have the advantage of having a stronger hook which makes a huge difference. ConsNot the cheapest lures out there. Soft lures are soft lures, if you are catching, they won't last that long, so order a few packs (it's worth it - I guess this would count as a Pro! Have started fishing soft baits for pike in the winter when they like slow moving bait deep down and found tsunamis lures to be great! Also works great for cod all year round. 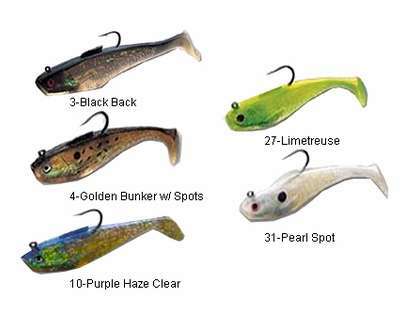 These lures are very well made and can handle fish over and over again. Striped bass love them and they have great action. ConsDo not cast very well. Is this price for a single lure? The Tsunami SS4 Soft Bait Swim Shad Lure priced at $5.99 is for 1 lure.